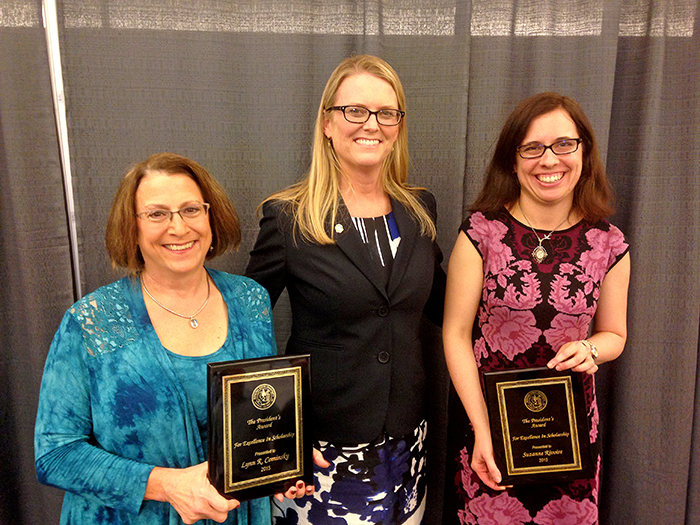 School of Science and Technology dean Lynn Stauffer congratulates Lynn Cominsky, left, and Suzanne Rivoire, right, on receiving the Sonoma State Excellence in Scholarship Award. Sonoma State University professors Lynn Cominsky and Suzanne Rivoire have earned the university's Excellence in Scholarship awards for their dedication to academic excellence. Provost Andrew Rogerson presented the awards at Sonoma State's University Research Symposium on April 15. "When students collaborate with faculty on research, they learn first-hand how experts solve practical problems. Their teachers become role models, mentors and guides for continuous lifelong learning," he said. "This is the classic teacher-scholar model that we value so highly at Sonoma State. Both Lynn Cominsky and Suzanne Rivoire exemplify this ideal and are well deserving of recognition." Cominsky, chair of the physics and astronomy department, has taught at Sonoma State since 1986, while Rivoire joined the university in 2008 as a professor of computer science. The Excellence in Scholarship award is given to two faculty members each year. Candidates are judged on their academic research and student involvement in that research, including how they mentor their students. Cominsky has been working with the Sonoma State University Education and Public Outreach Group, which was created in 1999. The group focuses on the primary aspects of the teacher-scholar model by working to train instructors and develop programs in K-12 schools in Mendocino County. "This award is a very nice recognition of everything I've done in my career here at Sonoma State," says Cominsky. "I was very happy to receive this award because the funding from the award sent four of my students to the CubeSat conference at Cal Poly last month." Rivoire has studied subjects varying from computer architecture to analyzing energy-efficient computers. Throughout her career, her research has impacted facilities like Microsoft Research-Silicon Valley and the Lawrence Livermore National Laboratory. Her research with large-scale computer systems has also benefitted the fields of astronomy, biology and climate science. Rivoire earned a Ph.D in electrical engineering from Stanford in 2008 and her research ranges from electrical engineering to computer science. In 2014, she spent the fall working with the Computer Science Research group in Tennessee as part of the Oak Ridge National Laboratory. "I was just absolutely surprised and honored to receive this award," says Rivoire. "Many people I admire and honor at this university have gotten this award recently and it's an absolute honor to be in that company." Rivoire says she enjoys seeing the direct impact she's had on her students while teaching at Sonoma State. "My favorite part of teaching is getting to know our undergraduate students and feeling like you can actually make a difference in their lives and careers," she says.